Electropolishing, also known as electrochemical polishing, anodic polishing, or electrolytic polishing (especially in the metallography field), is an electrochemical process that removes material from a metallic workpiece, reducing the surface roughness by levelling micro-peaks and valleys, improving the surface finish. It is used to polish, passivate, and deburr metal parts. It is often described as the reverse of electroplating. It may be used in lieu of abrasive fine polishing in microstructural preparation. Typically, the work-piece is immersed in a temperature-controlled bath of electrolyte and serves as the anode; it is connected to the positive terminal of a DC power supply, the negative terminal being attached to the cathode. 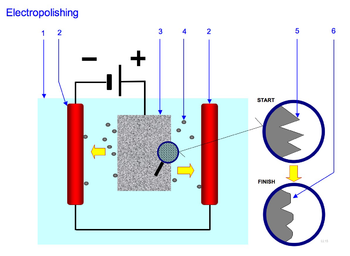 A current passes from the anode, where metal on the surface is oxidised and dissolved in the electrolyte, to the cathode. At the cathode, a reduction reaction occurs, which normally produces hydrogen. Electrolytes used for electropolishing are most often concentrated acid solutions having a high viscosity, such as mixtures of sulfuric acid and phosphoric acid. Other electropolishing electrolytes reported in the literature include mixtures of perchloric acid with acetic anhydride (which has caused fatal explosions), and methanolic solutions of sulfuric acid. To electropolish a rough surface, the protruding parts of a surface profile must dissolve faster than the recesses. This process, referred to as anodic levelling, can be subject to incorrect analysis when measuring the surface topography. Anodic dissolution under electropolishing conditions deburrs metal objects due to increased current density on corners and burrs. Most importantly, successful electropolishing should operate under diffusion limited constant current plateau, achieved by following current dependence on voltage (polarisation curve), under constant temperature and stirring conditions. Electropolishing has many applications in the metal finishing industry because of its simplicity and its ability to be used on irregularly shaped objects, such as stainless steel drums of washing machines, stainless steel surgical devices, and copper semiconductors. Ultra-high vacuum (UHV) components are typically electropolished in order to have a smoother surface for improved vacuum pressures, out-gassing rates, and pumping speed. Electropolishing is commonly used to prepare thin metal samples for transmission electron microscopy and atom probe tomography because the process does not mechanically deform surface layers like mechanical polishing does. The results of electropolishing are considered to be aesthetically pleasing by many people. Electropolishing creates a clean, smooth surface that is easier to sterilise. Electropolishing can polish areas that are inaccessible by other polishing methods. Electropolishing removes a small amount of material (typically 20-40 micrometre in depth in the case of stainless steel) from the surface of the parts, while also removing small burrs or high spots. It can be used to reduce the size of parts when necessary. Electropolishing stainless steel preferentially removes iron from the surface and enhances the chromium/nickel content for the most superior form of passivation for stainless steel. ^ G.F. Vander Voort, ed., "Chemical and Electrolytic Polishing," ASM Handbook, Vol. 9: Metallography and Microstructures, ASM International, 2004, p 281-293, ISBN 978-0-87170-706-2. ^ "The "Then & Now" of Electropolishing" (PDF). Anopol Limited/Surface World. Retrieved 20 March 2017. ^ "Surface Texture: Electroplishing and Ra" (PDF). Anopol Limited/British Stainless Steel Association. Retrieved 20 March 2017. ^ F. Kelly, Thomas; K. Miller, Michael (2007). "Atom probe tomography". Review of Scientific Instruments. 78: 031101. doi:10.1063/1.2709758. Retrieved 24 November 2017. ^ "Stainless Steel Electropolishing". Stainless Steel Electropolishing. Arrow Cryogenics. Retrieved 20 March 2017. ^ "Electropolishing Basics: How Electropolishing works on stainless steel". New England Electropolishing. Retrieved 20 March 2017. ^ H. Magee, John; Mohr, Robert. "Passivating and Electropolishing Stainless Steel Parts". Carpenter Technology. Carpenter Technology Corporation. Retrieved 4 December 2017. The "Then & Now" of Electropolishing by Anopol Limited/Surface World. Published January 2010. This page was last edited on 8 December 2018, at 19:51 (UTC).